This camera has the name CORBINA stamped on the front. Available for the USA Market. This camera is a Praktina FX-SA1 with the label "HEXACON SUPREME" attached to the front. This camera was available on the USA market from Peerless, New York. 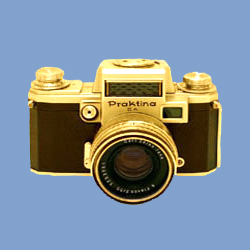 This camera is a Praktina IIA-A with the label "PORST Reflex" attached to the front. The camera has an additional flash shoe on the top cover and a camera back with a covering without the KW logo. The fitting of Eyelevel Finder with Meter is not allowed owing to the flash shoe. The flash shoe and the different covering on the camera back remove any reference mark of the KW manufacturer. This model was available for a short period on the German Market from Porst, Nürnberg. This camera is a Praktina IIA-DA with the label "Texographie T 2" attached to the front.